Not too long ago I was in a discussion with some friends who asked me if I had a chance to remake any movie with today’s special effects, which one would I do. My answer with no hesitation was VOYAGE TO THE BOTTOM OF THE SEA. Don’t ask me why this movie holds such a place in my movie going heart but every single time it’s shown on Turner Classic Movies, I stop what I’m doing and watch it. What’s even stranger is that I really didn’t care for the TV show that was based on the movie and rarely watched it but the movie…I guess it’s because I first watched it when I was a kid and I can still get in touch with that 12 year old who saw the movie for the first time and who sat there totally hypnotized by the story, characters and action. 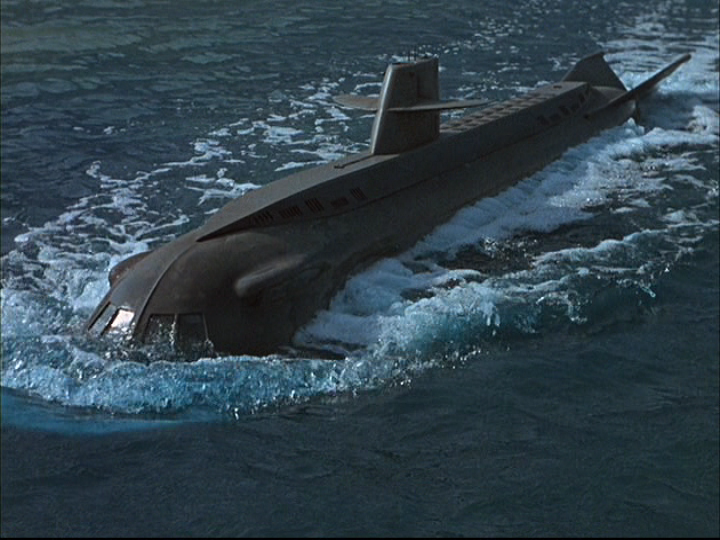 After we get past the theme song sung by then teenage idol Frankie Avalon (the 60’s version of Clay Aiken) we see our first view of the magnificent futuristic supersub Seaview as it leaps out of the water like a dolphin. Next to Captain Nemo’s Nautilus, The Seaview is probably the most famous fictional submarine you know. It’s sleek as a rocket with a unique transparent nose that is part of the observation deck where you can see the marvels of undersea life. The Seaview is the brainchild of Admiral Harriman Nelson (Walter Pidgeon) a brilliant, eccentric and arrogant (is there really any other kind in the movies?) scientist who is the founder of The Nelson Institute of Oceanographic Research and he’s taken The Seaview on a test run in the Arctic. Among those aboard The Seaview is the sub’s captain, Lee Crane (Robert Sterling) The Admiral’s personal assistant Lt. Cathy Connors (Barbara Eden), Nelson’s longtime friend Commodore Lucius Emery (Peter Lorre) Captain Crane’s right hand man Lt. Danny Romano (Frankie Avalon) as well as Dr. Susan Hiller (Joan Fontaine) who is observing the effects of long term undersea stress on the crew. Nelson’s sub has been considered a folly but the Arctic tests have proven the sub’s capabilities. : It’s not only the fastest sub ever built but it can dive deeper than any other sub. It carries more destructive capabilities than all the explosive power used during World War II and it has enough laboratories on board to qualify as a mobile research facility. Nelson is deliriously happy with the results of the tests and is relishing in his sub having proven its worth. But then, during some underwater tests, icebergs batter The Seaview and the sub surfaces to find the entire sky is on fire. In a spookily surrealistic scene, Admiral Nelson and Captain Crane see massive icebergs smoking due to their melting from the intensive heat. Nelson contacts Washington and finds out that the Van Allen Belt of radiation surrounding the earth has been ignited by a rogue comet and the temperature of the Earth is rising. He’s ordered to The United Nations where the world’s leading scientists are meeting to try and find a solution. The Seaview makes it from the Arctic to New York in two days (told you it was a fast sub) and Nelson presents his solution: he thinks that if The Seaview can fire a nuclear missile from The Marianas Trench at just the right angle at just the right time on just the right day, the nuclear explosion will blow the Van Allen Belt out into space and kill the fire. Nelson is violently opposed as the other scientists think the fire will burn itself out once it reaches a certain temperature. The problem with this plan is that if Nelson doesn’t get to fire his missile and if his colleagues are wrong, there will no chance for another try and the temperature will keep rising and burn the Earth to a cinder. Nelson and his crew have to fight their way out of The United Nations and back to The Seaview where Nelson orders Crane to head for The Marianas Trench. His intention is to get in touch with The President of The United States to get authorization. The radiation thrown off by the Van Allen belt makes this impossible and so Nelson decides to go ahead with his plan. The problem is this: The Seaview has been declared rogue and every submarine in the world has orders to blow it out of the water. So the intrepid crew of The Seaview not only have to make their deadline but they have to do it while dodging enemy submarines trying to stop them, a secret saboteur onboard, a giant squid, a lethal minefield and Nelson’s own arrogant stubbornness which leads his crew to near mutiny. And what if Nelson is wrong? Will his plan doom the Earth to certain destruction? 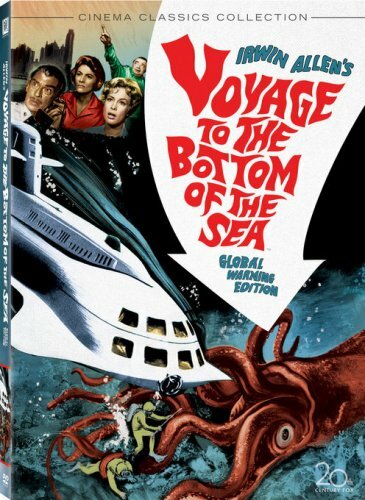 VOYAGE TO THE BOTTOM OF THE SEA is plain good old-fashioned non-stop pulp adventure from start to finish. There’s an amazing amount of good characterization provided by the actors, especially Walter Pidgeon, Peter Lorre, Barbara Eden and Joan Fontaine. The actors play it absolutely straight and even though the science in the movie is totally goofy, they sell it. Michael Ansara is also aboard the sub as a man who The Seaview picks up on the Arctic ice and who believes that The Seaview should be stopped in it’s mission as he believes it’s God’s will that if the world should come to an end, Nelson shouldn’t prevent it. They have a really good scene where Pigeon argues with Ansara that if God believes that that world should come to an end then why did God give man the intelligence and capabilities to try and prevent that end? It’s a really tense scene that lifts the movie out of what could have been a cheesy standard sci-fi underwater adventure and gives it a little thought and philosophical substance. The movie also has great suspense as even Lee Crane begins to doubt Admiral Nelson, who he looks on as a father and he’s torn between his love and respect for the Admiral and his concern for his men. And to make things even worse there are signs that even the iron-willed Admiral Nelson might be cracking under the strain of trying to save the world. And who is sabotaging The Seaview? Is it Dr. Hiller who thinks that Nelson is suffering from stress? Or is it the religious fanatic Alvarez (Michael Ansara)? Or could it just be one of the crew who has begun to doubt Nelson? The special effects are what you would expect from the 1960’s but they’re awfully effective, especially the attack by the giant squid but the truly terrifying scene where The Seaview has to navigate a mine field gets my vote as the real nail biter. And the last fifteen minutes of the movie where Alvarez holds the control room of The Seaview hostage with a bomb and time is running out to fire the missile is just as good. So should you see VOYAGE TO THE BOTTOM OF THE SEA? Hell, yes. Even though it was made back in the 60’s I really don’t think it’s dated as all in terms of story and acting. It’s a terrifically entertaining Saturday Afternoon movie that wants nothing more than for you to sit back and be thrilled by the adventure on the screen. It’s got action, suspense, one of the coolest submarines ever put on film and terrific performances by an old school cast that knows they’re making a B-movie and they’re gonna make a damn good one. 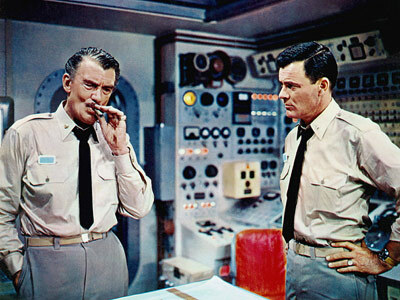 See it and I dare you to tell me VOYAGE TO THE BOTTOM OF THE SEA doesn’t deserve a “King Kong”style big-budget remake.